Experience scenic, compelling Japan, visiting unique ports and rarely seen wilderness areas in luxury on board exclusively chartered 'Le Soleal.' Listen to lectures from A&K's award-winning Expedition Team. Cross the International Dateline and arrive at Osaka’s Kansai International Airport. After clearing customs and immigration, meet your A&K representative and transfer to your tranquil Kyoto hotel, situated in a historic area of Higashiyama Shichijo. Spend the remainder of the day at leisure. Alternately, with insight from our experts, set out to explore Kyoto at your own pace. This culturally rich former capital features over 2,000 temples and shrines, 17 of which have been designated as UNESCO World Heritage Sites. Because the city largely avoided bombing during World War II, its historic aura remains intact. Today, choose from three excursions, such as an enlightening tour of Kyoto, where you visit the Golden Pavilion (Kinkakuji Temple); attend a talk about Zen Buddhism at Tenryuji Temple; and explore the Heian Shrine. Or, you may visit historic Nara, the first Japanese capital, including Houryuji, the counry’s oldest temple. Alternately, pay a visit to a tea factory and attend a traditional tea ceremony, followed by visits to Byodoin Temple and Uujigami Shrine, a UNESCO World Heritage Site. Gather this evening for a welcome reception and dinner with fellow guests, your team of A&K specialists and local guides who will be accompanying you and enriching your voyage. After breakfast at the hotel, enjoy the morning at leisure or join a guided walking tour of the temples in the surrounding Higashiyama Shichijo district. After lunch, transfer from Kyoto to Osaka, where you board luxurious ‘Le Soleal,’ your floating home for the next 11 nights. Throughout your journey, enjoy access to experts both on board and ashore, as well as ongoing conversations with our Expedition Team. Arrive this morning in Takamatsu, gateway to Shikoku Island. Choose from an array of intimate, thoughtfully planned excursions. Whether revolving around nature, gastronomy, arts or culture, each has been designed to reveal Japan at its most authentic. You may, for example, travel to Naoshima Island by ferry for a full-day excursion, celebrating its architecture and art museums. Visit the breathtaking hillside Chichu Art Museum and stop at Benesse House, a complex featuring unique work by Japanese and international artists. Alternately, board a high-speed boat to Shodoshima, or Shodo Island, the heart of Japan’s olive-growing industry for a full-day tour. You may otherwise remain on Shikoku Island, experiencing Takamatsu’s most acclaimed features. Begin with a visit to Ritsurin Park, one of Japan’s finest gardens. After taking in the pond, bridge and hill-stippled setting, attend a hands-on udon noodle-making demonstration to gain insight into this local culinary art. Spend the rest of the day at your own pace in the lovely port of Takamatsu, with time to explore the shops and enjoy the lively atmosphere. Return to the ship at leisure. Arrive in the port of Hiroshima, where you may opt to visit the Hiroshima Peace Park and Museum, its cenotaph containing names of the known victims of the atomic bomb. Then, take a speedboat ride to Miyajima Island to witness the scarlet Torii Gate at the entrance to the sacred Shinto Shrine. Or take a full-day excursion through Hiroshima, visiting the Hiroshima Castle and Hiroshima Peace Park and Museum, where you attend a private talk with an atomic bomb survivor. Alternately, spend a full day on the tranquil island of Miyajima, including the Itsukushima-Jinja, the shrine complex listed as a UNESCO World Heritage Site and National Treasure. Ascend Mount Misen by cable car for a hike. Then, admire the Shinto Shrine and Torii Gate. 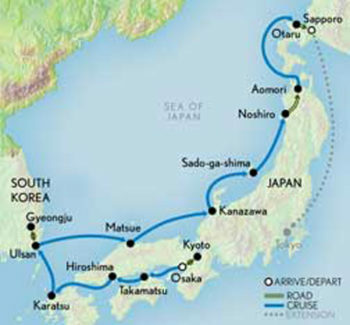 Return to your vessel and continue sailing through the Kamnon Strait en route to the Korea Strait. This afternoon, ‘Le Soleal’ arrives at the port of Karatsu. Once an early trading post between Japan and mainland Asia, Karatsu still maintains its medieval heritage. Visit Karatsu Castle, known as the “flying crane castle.” Pay a visit to the Hikiyama Exhibition Hall, which houses the floats and artifacts used in the annual Karatsu Kunchi autumn festival, recently inscribed on the UNESCO Intangible Cultural Heritage list. You may also visit Ningyo Joruri (puppet theater) and the Nakazato Taroemon Kiln, a ceramic studio that has been active since the late 16th century. Alternatively, visit the Kitahata Shige region to meet green tea farmers, along with the chance to pick your own tea leaves. Disembark and spend a full day exploring Gyeongju, South Korea, ancient capital of the Shilla Dynasty and a UNESCO World Heritage Site. Gyeongju’s cultural heritage dates back to the first millennium. Witness its excavated monuments, temples, tombs and pagodas, gaining insight from your cultural historian. Then, unearth the treasures of the National Museum, which houses an exceptional collection of jewelry, weapons and pottery. Sit down to a lunch of Korean delicacies, and witness a traditional dance performance. Alternately, gain insight on South Korean culture and join a special visit to the Hyundai Motor factory. Return to Japan and disembark at Sakaiminato to visit Matsu, the “town of water,” nestled between a scenic lake and a large lagoon. Choose to explore the countryside, pausing at the Peonies Village to wander through its picturesque Yuushien Garden. Pause for lunch at a local restaurant before visiting historic Matsue Castle, one of Japan’s few remaining medieval castles, built in original wooden form. Alternately, visit the garden-frocked Adachi Museum of Art, which melds the founders’ passions for art and garden design. Following a traditional lunch at a ryokan (inn), visit Yakumo-mura village to learn about the art of Japanese papermaking. Spend the day exploring the thriving art center of Kanazawa, known for its Kutani-style pottery and gold-leaf workmanship. Choose from various experiences that allow you to traverse its winding cobblestone streets. Perhaps see traditional houses, museums and galleries, and the Higashi Chaia geisha district. Or, choose a more active excursion that includes a hike in Kakusenkei Gorge; lunch at a local restaurant; and an onsen (spa) experience in the Yamanaka Onsen district, or a visit to scenic Shirakawa-go and the Shogawa River Valley. The next day, wander through its Omicho Market at your leisure, which features everything from fresh flowers to fish and local handicrafts. Tonight, join fellow guests for a private dinner event with live entertainment. Travel off the beaten path and arrive at pastoral Sado Island, with its rice paddies; bamboo groves; and dramatic, surf-pounded seacoasts. Political exiles, deposed emperors and intellectuals were once “banished” to live in this beautiful setting. Today, opt for a nature excursion to Ogi Peninsula and its lighthouse, or a relaxing Taraibune tub-boat tour. Later, enjoy an exclusive, private performance by the fabled Kodo taiko drummers. Return to your ship and set sail for the west coast of Japan’s mainland. Disembark in Noshiro and head to Towada-Hachimantai National Park, passing en route through the panoramic mountain plateau region of Hachimantai, part of the UNESCO Intangible Cultural Heritage list. Pause at the Great Drum House to witness the drums used in the Tsuzureko Shrine Festival. Then, hike or take a boat ride at the ancient caldera of Lake Towada, formed by the eruption of a volcano. For a more in-depth nature experience, you may choose a trekking excursion to Juniko Lake alongside an A&K naturalist and a national park nature guide. Later this afternoon, re-board your vessel in Aomori. After breakfast on board ‘Le Soleal,’ disembark in Otaru, where you transfer to the airport in Sapporo. Board your homebound flight, join the post-cruise group extension to Tokyo, or continue onward with your independent travels. Butler service available in Suite categories 5-8. First group event: city tour at 8:00 a.m. on May 31. Last group event: disembarkation in Otaru on Jun 12.